On Wednesday Dr. McKenzie, Michi, Don, Mike, and Jared took off for Big Pike Lake while Jordan and I returned to the Copper River. There was a lot of attractive water that we hadn’t explored yet. The temperature was 45 degrees when we left and my feet got quite cold in the morning. The sky cleared in the early afternoon and the sun came out by mid-afternoon. By Wednesday I realized that Jordan was an all-star guide, and in addition to catching lots of nice fish, I was learning many new techniques I could apply in Colorado. 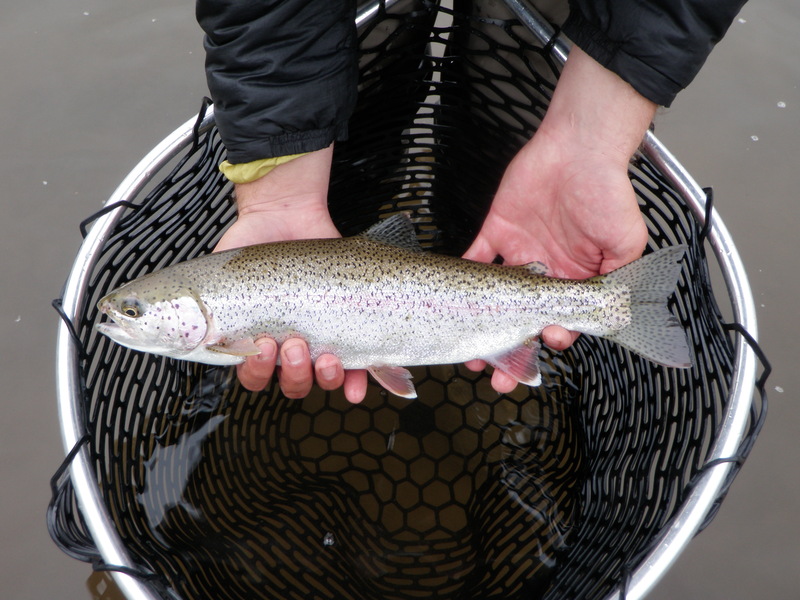 Jordan is 23 years old, but wise beyond his years due to growing up fishing in rivers and streams flowing into the Great Lakes and fishing for steelhead. In addition, he is 6 ft, 3 in. tall and towers above the river. Jordan’s ability to spot fish and read water surpassed mine and is among the best I’ve witnessed. I booked the Alaska trip through Taylor Edrington of Royal Gorge Anglers, and Jordan worked for Taylor at a different lodge in a previous summer. Because of this association, Mark assigned Jordan as my guide, and I was definitely the beneficiary. 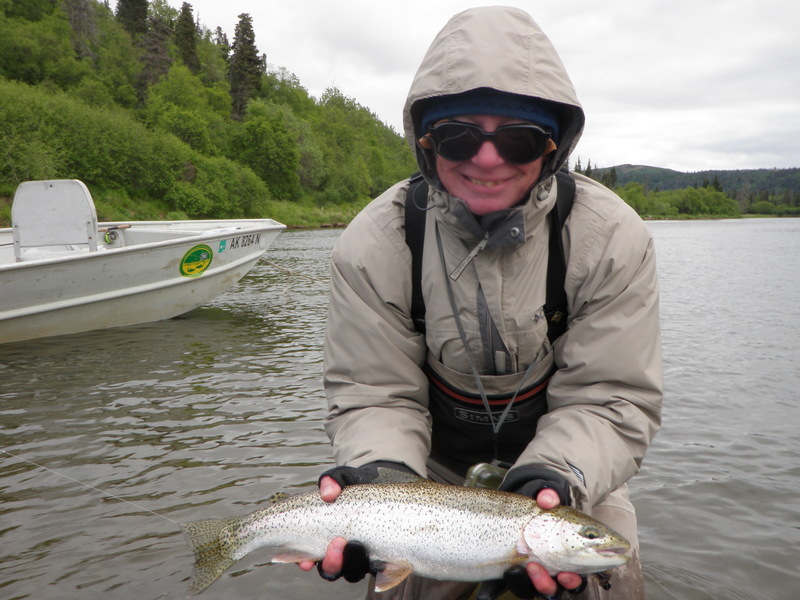 This was Jordan’s first summer with Alaska Rainbow Point Lodge. Perhaps the greatest lesson I learned from observing Jordan was the attention he paid to weight and placement of the indicator. 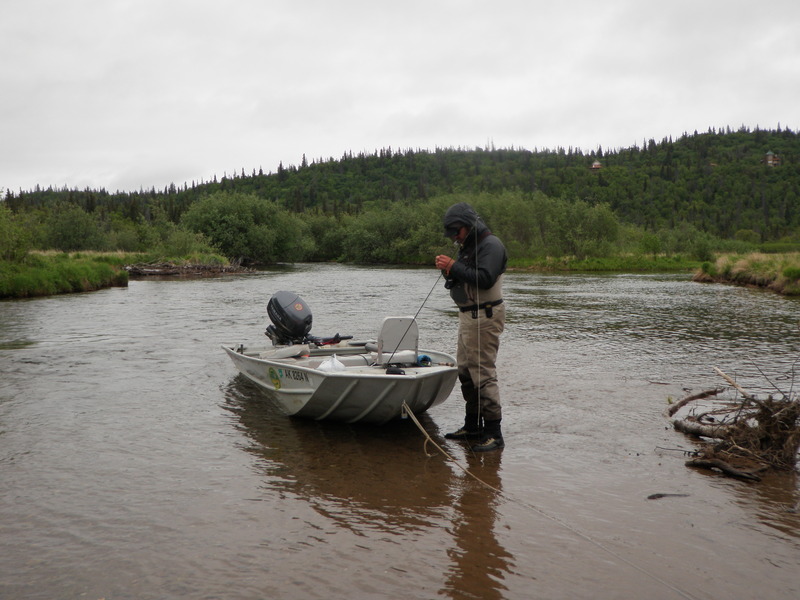 Whereas I am prone to put on one split shot and fish a river with the strike indicator in the same spot for an entire day, Jordan was constantly making adjustments based on water depth, current velocity, and our physical approach to a stretch of water. I will definitely apply this to my future fishing outings. A second important lesson was making stack mends. When fishing with nymphs and an indicator, Jordan taught me to cast across the river and then make one or two big mends to get the fly line bowed above the indicator. The trick after executing the initial cast and mends was to then feed out line at a constant pace while making short flicking upstream mends. This kept the indicator and flies moving downstream drag free. By the last day on the Copper River I was making 30 yard drag free drifts. This technique carries numerous benefits. First, one can approach fish from above because you are very distant from the downstream fish. Second you cover a huge amount of water on a single cast. It is both efficient and less likely to disturb the water. Third, I believe I will be able to fish areas of the river on the far side of a strong mid-stream current using this method. The third lesson Jordan taught me was to be confident in fishing streamers. Here again he taught me how to cast across stream and allow the streamer to sink and then let it swing until directly below. He taught me to point the tip of the rod down and toward the line and watch the line carefully where it enters the water. We tried varying the retrieve by stripping sometimes and also twitching at the end of the drift. When we used Jordan’s rods, he installed a sink tip line, and I discovered the value of that addition to my equipment. I rarely fish streamers and use it as an offering of last resort. Hopefully this will no longer be the case. Jordan allowed me to cast his two-handed 12 foot spey rod and taught me one of the many casting techniques. I have much to learn in this realm, but it demonstrated the power and distance that can be gained with this technique. 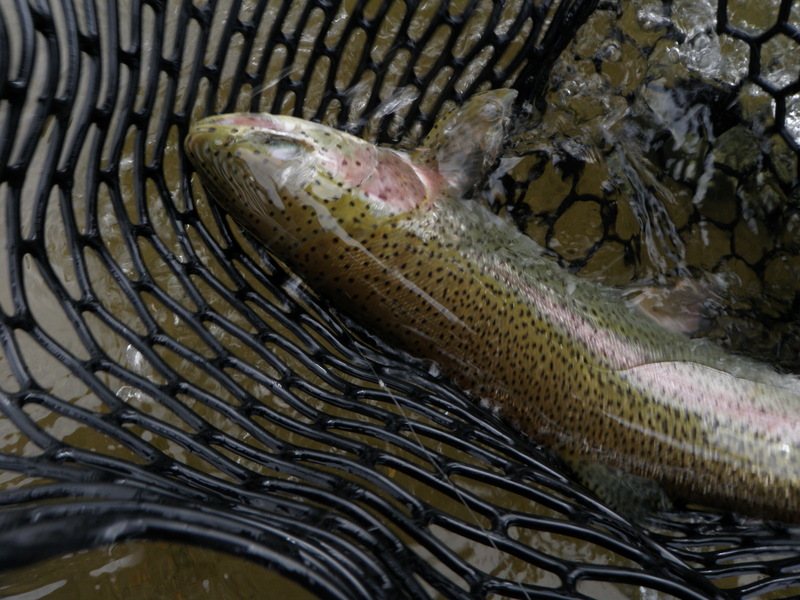 So on Wednesday Jordan led me back to the sweet long run where I’d landed two 20+ inch rainbows on Tuesday. We worked the whole run top to bottom. For the close in fishing I used the style of nymphing I am familiar with in Colorado; three quarters upstream, then lift the rod as it drifts across from me, then lower the rod and release line. For the area requiring longer casts Jordan instructed me on the stack mend technique described above. We were using the same pheasant tail combination that had worked yesterday and this yielded six rainbows by lunchtime with the largest being around 16 inches. Toward the end of the morning we switched to the spey rod, and I struggled with this technique, but did land one fish on the spey. After lunch we moved upstream to the “mouse eddy” below a small island. Here we noticed a decent amount of rising fish with quite a few caddis in the air, so Jordan tied on a black foam body caddis with a tuft of orange poly over the wing for visibility. 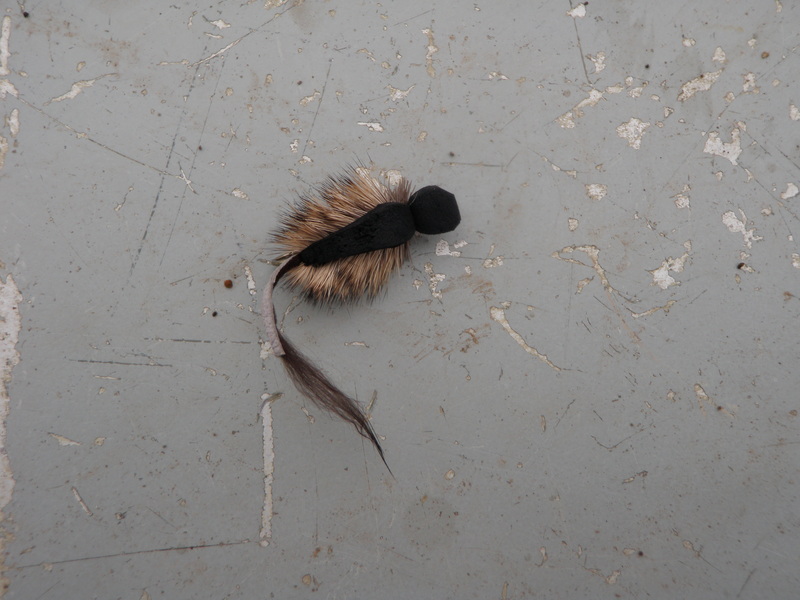 This proved to be quite effective, and I landed three or four fish on the black caddis. We continued upstream and returned to the eddy across from Tuesday’s lunch beach where I landed a couple more fish. Next we hit a different wide run where Jordan set me up with the spey rod again and a sink tip line with a white and green Clouser-style streamer. 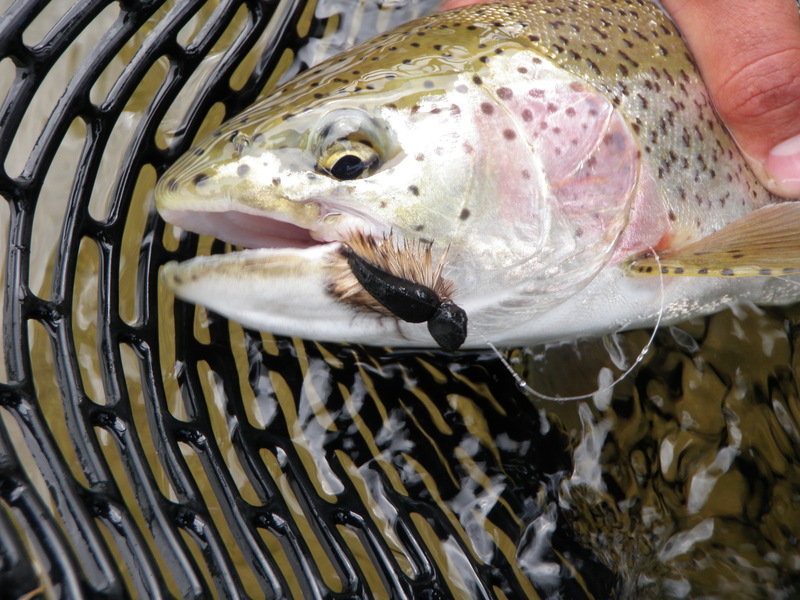 I took one rainbow on this set up when it struck while the fly dangled below me. 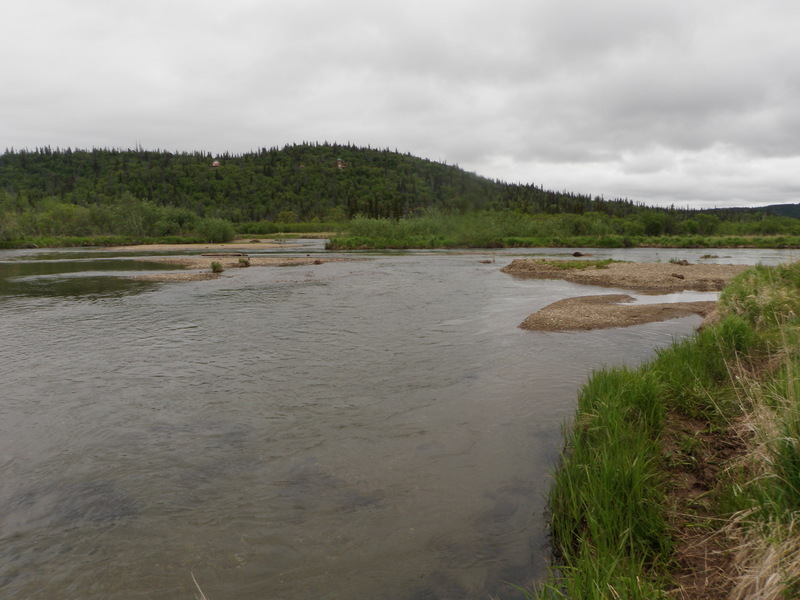 Our final location was near the mouth of the Copper in some slack water next to the right bank facing upstream. There were fish rising in this area, so Jordan had me return to fishing the caddis with the pheasant tail dropper. I landed 3 or 4 small rainbows in this area that I counted, but many more too small to count. At this point in the day we were approaching quitting time, and I’d landed 19 of 28 hook ups. It would be my highest total of fish landed, but the fish were on average smaller than the previous days. We had a small remaining slot of time to catch number 20, so Jordan tied on a Moorish Mouse and had me work the bottom 20 yards of the slack water with the high bank. I began casting the mouse hard against the bank and immediately wiggling and stripping back toward me. Jordan watched, but I wasn’t getting any response, so he decided to go back upstream to get the jet boat and then come back and pick me up. When he reached the boat, I’d covered 90% of the targeted bank. I tossed another cast and it began to streak away as I wiggled. The mouse had traveled no more than three feet when a huge mouth appeared and chomped down on the mouse. I set the hook and shouted to Jordan who rushed the boat down and helped me land a 22” rainbow with a mouse stuck in its mouth. What a thrill! I’d read articles about this, but actually got to experience it. We took a bunch of photographs and streaked back to the lodge. 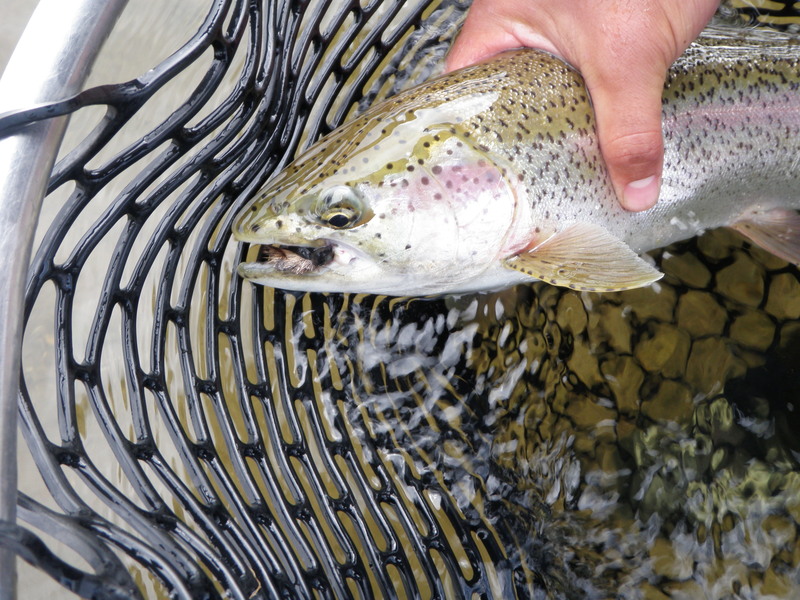 20 fish were landed on the Copper River, and a 22 inch monster ate a fake mouse.